Horses teach responsibility. They instill trust and respect. They motivate our students to learn and help them become stronger, more confident and balanced. And they do it all without speaking a word. It is this combination of qualities that we harness to develop meaningful and relevant programs for students. Today we collaborate with more than 60 schools and organizations on programs customized to their needs. “I think this experience at Fieldstone could change the whole trajectory of our students’ lives in a really positive way,” says Julie Meese, Intervention Specialist at Cleveland Heights/University Heights School District. “Being around horses and the farm transformed our students. They had a different energy. 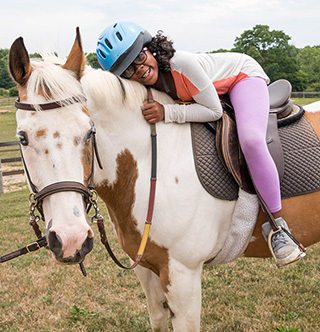 They were respectful and gentle with the horses and so proud of learning to ride,” says Amy Btiebet, Director of Programming, Open Doors Academy. For more information about our programs with schools and organizations, please click here.